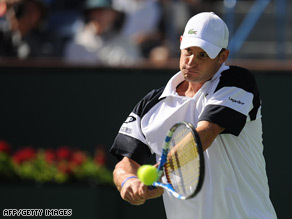 Andy Roddick continued his winning run to end world No. 3 Novak Djokovic’s title defense at the Indian Wells Masters Series event in California and set up a semifinal with world No. 1 Rafael Nadal. Nadal, who is seeking to regain a title he won in 2007, hit the practice courts straight after his win over 20-year-old world No. 6 Potro in preparation for Saturday’s clash with Roddick. “I just went to serve a little bit, practice a little bit more the serve, because I served well in the beginning, but later I had some mistakes and a little bit more the backhand. I wanted to play a little bit longer the backhand. But that’s it. I’m happy,” the 22-year-old Spaniard said. World No. 2 Roger Federer faces fourth-seeded Andy Murray in Saturday’s other semifinal.